Create a standard Windows Universal application and add 3 Buttons and a RadListView control to it. The first button will list all of the files uploaded in our storage. 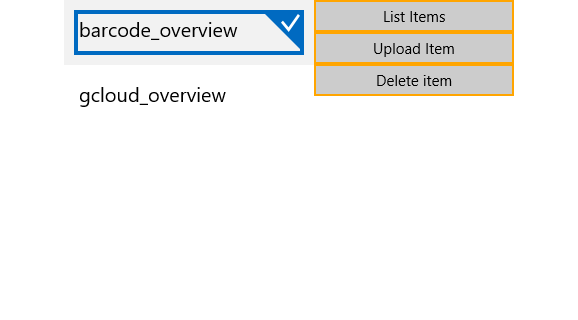 The second button will upload a file and the third one will delete the selected file in the RadListView. The next step is to create the ViewModel. It will need a StorageClient object which will be used for uploading, deleting and listing files. We also need to implement all of the commands that the Buttons are bound to. The example uses verification through a JSON string, however, there are different options. Please read the Setting Up Authentication for Server to Server Production Applications article. All that is left now is to set the DataContext of the MainPage and run the application.